MARNI DRIVER ( ME605S ) These women's sunglasses combine different materials and finishes, reflecting Marni's composite, refined aesthetic. The contrast between the round lenses and the sharp-angled frame creates an original graphic and geometric impact, enhanced by the metal profile in the upper line of the acetate. Transparent colors are combined with the bright gold finish, which is also featured on the Marni logo engraved inside the temples. MARNI CROP ( ME613S ) An original design of full and empty spaces characterizes these men's sunglasses. Acetate and metal come together in perfect harmony, merging thick, speckled geometric sections with slim profiles with a gold finish. 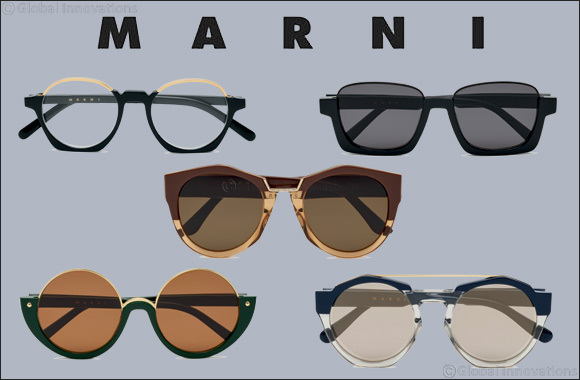 The Marni logo is discreetly engraved inside the temples, brightened by the same gold tone as the frame front.